British architects and engineers have developed a unique way to keep Russians warm in minus 30C winters - cover their buildings in 'intelligent fur coats' lined with green plants. 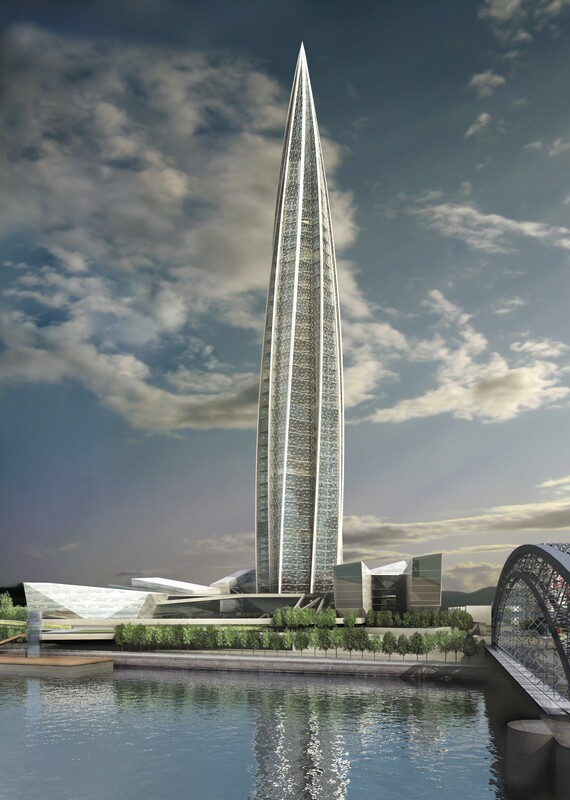 The cutting-edge, energy-saving concept developed by UK architects RMJM will be used to build Europe's tallest building - the 396m high Okhta Tower in St Petersburg. 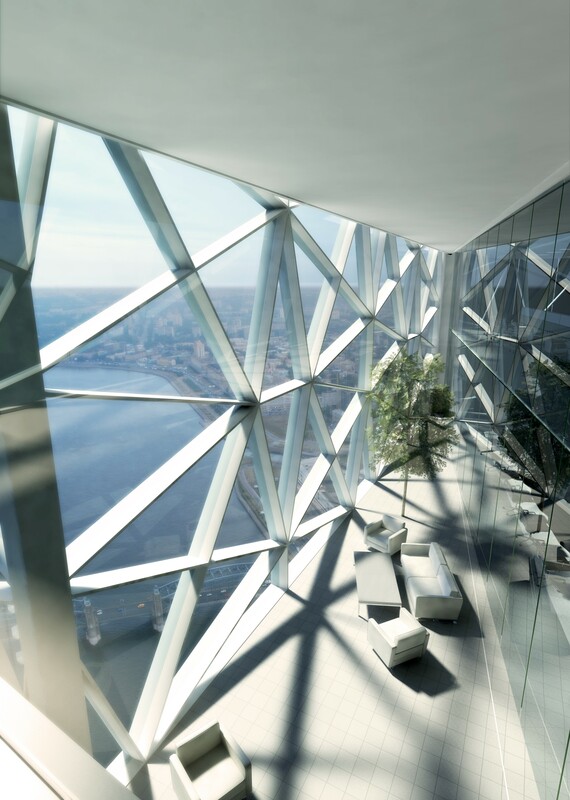 The 79-storey high Okhta Tower - the new HQ of energy giant Gazprom - will be cased in two giant glass and steel sensor-lined 'envelopes' with plants and shrubs filling the buffer zones in between. The design will slash the cost of heating in cold weather while utilising intelligent ventilation to keep people cool in summer. It's a world first - making the £1.2 billion Okhta Tower one of the most sustainable buildings in the world. The plants provide natural thermal insulation during winter and create a rich source of fresh air to ventilate and keep offices cool during the summer. This green buffer zone will use sensors to respond to the weather. The building will be finished with an intelligent exterior of temperature-colour changing glass panels. RMJM director of group design Tony Kettle calls it the architectural equivalent of a green-tech 'Russian Doll'. "The building will be alive - it will breathe, think and make decisions about how best to use energy," Mr Kettle said. "In cold weather, it takes warm air out of the offices before they become overheated - this half way green insulation zone between the outside and inside temperatures reduces heating fuel costs. For example, the office temperature might be 21 degrees, the buffer zone 10 degrees, while minus 30 degrees outside. In warmer weather, the technology takes fresh air from outside into the green buffer zone, and in turn moves that fresh air in to cool the office space. "We were keen for Gazprom to set new standards in energy conservation with this building. We put our best minds together to come up with a green solution with leading science and technology - and we're pretty excited with the result and how else this concept might be used around the world. This is a very clever design with sustainability in mind," he said. The development rejuvenates a derelict industrial site on the banks of the River Neva. As well as its tower, the new Okhta Centre will cover 77 hectares including further commercial space, a concert hall, museum, sporting arena and public green areas. RMJM beat off five international architecture firms to win the design commission. Construction starts later this year scheduled for completion in 2012. Tony Kettle from RMJM is available for interview. RMJM is a UK-based, international firm of architects, employing 1200 people across its network of 16 offices in the UK, Europe, the Middle East, the Far East and the United States. RMJM's expertise and design-led approach is successfully demonstrated in ongoing projects in more than 15 countries spanning a wide range of key sectors, from corporate headquarters and waterfront residential developments to major public buildings, university campuses and large-scale regeneration programmes. The company currently has £8 billion worth of construction projects on its drawing boards, including some of the world’s most high profile and ambitious projects. This press release was distributed by ResponseSource Press Release Wire on behalf of Clarity Communications in the following categories: Environment & Nature, Business & Finance, Public Sector, Third Sector & Legal, Manufacturing, Engineering & Energy, Construction & Property, for more information visit https://pressreleasewire.responsesource.com/about.